The comedian, best known for her lacerating wit, stopped breathing during a procedure on her vocal cords at an outpatient clinic last Thursday. The actress and stand-up comedian is well known for her legendary put-downs and has more recently turned her razor-sharp tongue on the red carpet's worst dressed celebrities, hosting the E! network's Fashion Police. Both Rivers and Melissa, her only child, have appeared together in reality TV show Joan & Melissa: Joan Knows Best? She didn't just fire her barbs at others, however. She was always prepared to joke about herself, and in particular her plastic surgery. In 2010, she tweeted a joke about her death, saying: With all the plastic surgery I've had I'm worried that when I die, God won't recognise me! Shortly after her death was announced, tributes poured in from the world of entertainment. US talk show host David Letterman called Rivers "a real pioneer for other women looking for careers in stand-up comedy". He recalled her guest spots on his show, saying: "She would come out here and sit in this chair and say some things that were unbelievable. "But it was hilarious… the force of her comedy was overpowering," he added. On his show, Jimmy Fallon said: "We loved her. 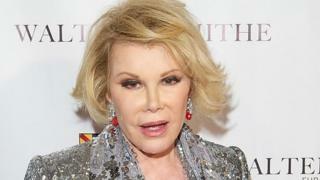 We will definitely miss her," while veteran TV interviewer Larry King said: "We will never see her like again." Comedian and actress Whoopi Goldberg tweeted: "My friend Joan Rivers has passed away once again to quote Billy Crystal... There are no words. Bon Voyage Joan." TV show host Ellen DeGeneres also described Rivers as a pioneer, adding: "She paved the way for a lot of comedians. I'm very sad she's gone." Lena Dunham, writer and star of sitcom Girls, said: "Watching Joan Rivers do stand-up at age 81 was incredible: athletic, jaw-dropping, terrifying, essential. It never stopped. Neither will she." Comedian Sarah Silverman said: "My heart is torn in half. She wasn't done." Kelly Osbourne, who appeared with Rivers on her TV show Fashion Police, said she was "my teacher, therapist, closest friend, inspiration and the only grandmother I ever knew." The Prince of Wales also paid tribute to Rivers, who attended his wedding to the Duchess of Cornwall in 2005 and performed at a gala for the Prince's Trust on his 60th birthday. "Joan Rivers was an extraordinary woman with an original and indefatigable spirit, an unstoppable sense of humour and an enormous zest for life. She will be hugely missed and utterly irreplaceable," he said. She was born Joan Alexandra Molinsky in Brooklyn, New York, to a family of Jewish immigrants who had fled the Russian Revolution. Her big break came in 1965 when she appeared on The Tonight Show Starring Johnny Carson, and a long television career followed. However, her mentor Carson never spoke to her again after she landed her own, short-lived late-night talk show on Fox. Her stand-up act took no prisoners and her comments often proved controversial. Following the 2013 Academy Awards, at which British singer Adele performed her Oscar-winning Bond theme Skyfall, Rivers joked about the singer's weight on The Late Show with David Letterman. "She was very scared because she was singing at the awards," said Rivers. "She kept saying, 'My throat, my throat - I don't know if I can swallow.' And I said, 'Oh, yeah! You can swallow.'" Last month, she was criticised for a rant on the Israeli-Gaza crisis, after suggesting to a TMZ reporter that the Palestinians were to blame for the conflict. Her first marriage lasted only six months but her second with Edgar Rosenberg spanned more than two decades until his suicide in 1987.